Cactus Island by William Manchee, a Mysterious Review. 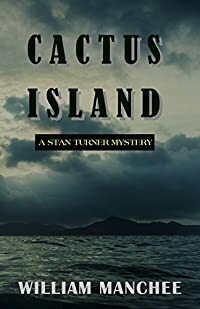 Review: Cactus Island, the 7th mystery in the Stan Turner series by William Manchee, features the Dallas-based attorney and his partner, Paula Waters, separately hired to represent two defendants accused of murder. Though their cases are not apparently related, it ultimately becomes clear there is something that links them together. Stan agrees to defend a young man, Steven, who was driving a Jeep when it went over a cliff in the Texas hill country and crashed, killing his passenger, a rival for the girl he loved. Steven claims the crash was an accident, and that he was distracted by the sudden presence of an alien spacecraft overhead while negotiating a turn in the road. Paula, originally hired to handle the divorce of Cheryl Windsor, is suddenly put in the role of her defense attorney when she's accused of murdering her husband, who has disappeared though no body has been found. Cheryl maintains her innocence even though circumstantial evidence suggests she may have killed him. Both of these cases, and the possibility they are connected in some way, provide an intriguing premise for this book. However, what starts out so promising descends into the absurd by the end of the book. Significant inconsistencies in the plot are left either unresolved or given irrational explanations. The irony here is that Manchee sets up a logical explanation for the events taking place around Cactus Island, yet that solution is merely a red herring to the illogical conclusion that is finally revealed. In retrospect, Manchee foreshadows the flawed logic in Cactus Island in the prelude. While attending the funeral of his son, Peter, Stan states, "For anyone who discovered the truth would suffer the same fate as Peter." Obviously Stan knows "the truth" and clearly he has not suffered the same fate as his son as he is still alive to tell the story. And what a story it is: a silly plot with holes large enough to fly a spaceship through. Acknowledgment: Top Publications provided a copy of Cactus Island for this review. Location(s) referenced in Cactus Island: Dallas, Texas Hill Country, British Virgin Islands.